Laryngeal cancer treatment and surgery India offers information on Laryngeal Cancer Doctor India, Laryngeal Cancer treatment and surgery Hospital India, Laryngeal Cancer treatment and surgery Abroad, Laryngeal Cancer causes, symptoms, Risk factors, treatment and surgery. The larynx is an organ at the front of your neck. It is also called the voice box. It is about 2 inches long and 2 inches wide. It is above the windpipe (trachea). Below and behind the larynx is the esophagus. The larynx has two bands of muscle that form the vocal cords. The cartilage at the front of the larynx is sometimes called the Adam's apple. Breathing : When you breathe, the vocal cords relax and open. When you hold your breath, the vocal cords shut tightly. Swallowing : The larynx protects the windpipe. When you swallow, a flap called the epiglottis covers the opening of your larynx to keep food out of your lungs. The food passes through the esophagus on its way from your mouth to your stomach. Talking : The larynx produces the sound of your voice. When you talk, your vocal cords tighten and move closer together. Air from your lungs is forced between them and makes them vibrate. This makes the sound of your voice. Your tongue, lips, and teeth form this sound into words. Who's at risk for larynx cancer? Age : Cancer of the larynx occurs most often in people over the age of 55. Gender : Men are four times more likely than women to get cancer of the larynx. Race : African Americans are more likely than whites to be diagnosed with cancer of the larynx. Alcohol : People who drink alcohol are more likely to develop laryngeal cancer than people who don't drink. The risk increases with the amount of alcohol that is consumed. The risk also increases if the person drinks alcohol and also smokes tobacco. A personal history of head and neck cancer : Almost one in four people who have had head and neck cancer will develop a second primary head and neck cancer. Occupation : Workers exposed to sulfuric acid mist or nickel have an increased risk of laryngeal cancer. Also, working with asbestos can increase the risk of this disease. Asbestos workers should follow work and safety rules to avoid inhaling asbestos fibers. Physical exam The doctor will feel your neck and check your thyroid, larynx, and lymph nodes for abnormal lumps or swelling. To see your throat, the doctor may press down on your tongue. Indirect laryngoscopy The doctor looks down your throat using a small, long-handled mirror to check for abnormal areas and to see if your vocal cords move as they should. This test does not hurt. The doctor may spray a local anesthesia in your throat to keep you from gagging. This exam is done in the doctor's office. Direct laryngoscopy The doctor inserts a thin, lighted tube called a laryngoscope through your nose or mouth. As the tube goes down your throat, the doctor can look at areas that cannot be seen with a mirror. A local anesthetic eases discomfort and prevents gagging. You may also receive a mild sedative to help you relax. Sometimes the doctor uses general anesthesia to put a person to sleep. This exam may be done in a doctor's office, an outpatient clinic, or a hospital. CT scan An x-ray machine linked to a computer takes a series of detailed pictures of the neck area. You may receive an injection of a special dye so your larynx shows up clearly in the pictures. 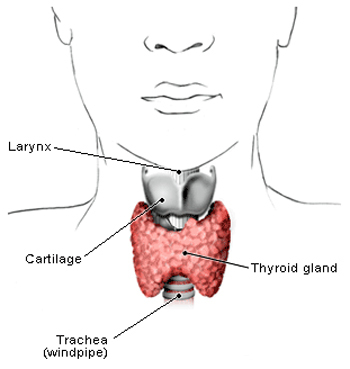 From the CT scan, the doctor may see tumors in your larynx or elsewhere in your neck. Biopsy If an exam shows an abnormal area, the doctor may remove a small sample of tissue. Removing tissue to look for cancer cells is called a biopsy. For a biopsy, you receive local or general anesthesia, and the doctor removes tissue samples through a laryngoscope. A pathologist then looks at the tissue under a microscope to check for cancer cells. A biopsy is the only sure way to know if a tumor is cancerous. The doctor can describe your treatment choices and the results you can expect for each treatment option. You will want to consider how treatment may change the way you look, breathe, and talk. You and your doctor can work together to develop a treatment plan that meets your needs and personal values. The choice of treatment depends on a number of factors, including your general health, where in the larynx the cancer began, the size of the tumor, and whether the cancer has spread. Radiation therapy alone : Radiation therapy is used alone for small tumors or for patients who cannot have surgery. Radiation therapy combined with surgery : Radiation therapy may be used to shrink a large tumor before surgery or to destroy cancer cells that may remain in the area after surgery. If a tumor grows back after surgery, it is often treated with radiation. Radiation therapy combined with chemotherapy : Radiation therapy may be used before, during, or after chemotherapy. Total laryngectomy: The surgeon removes the entire larynx. Partial laryngectomy (hemilaryngectomy): The surgeon removes part of the larynx. Supraglottic laryngectomy: The surgeon takes out the supraglottis, the top part of the larynx. Cordectomy: The surgeon removes one or both vocal cords. After surgery, some people may need a temporary feeding tube. This picture shows the pathways for air and food after a total laryngectomy. The stoma is the new opening into the trachea. Before surgery or radiation therapy : In some cases, drugs are given to try to shrink a large tumor before surgery or radiation therapy. After surgery or radiation therapy : Chemotherapy may be used after surgery or radiation therapy to kill any cancer cells that may be left. It also may be used for cancers that have spread. Instead of surgery : Chemotherapy may be used with radiation therapy instead of surgery. The larynx is not removed and the voice is spared.